I have never been a fan of Christian rap. Until I heard Lecrae. Admittedly, I am way late when it comes to his work. I have heard a few of his songs over the years. I have had friends who have told me how great his work is. I have even met fans of his who are not your “stereotypical” Christian. For years, I have struggled with this new wave of music. Everything sounds the same. The beats, the lyrics, the delivery. Everything. Gone are the days of boy bands, rock bands and girl groups. Everyone seems to be all about self. Gone are the days of originality, substance and groundbreaking. Everyone is doing what everyone else is doing. These facts are precisely why I have stuck with my old school music. I love music from the 60s, 70s, 80s, 90s and a few songs from the early 2000s. I miss the days where I can turn on the radio and hear good quality music. I miss the days of BET & MTV showing videos. I miss the days of waiting with great anticipation for someone’s album to be released. So for me, sifting through all the rift raft to get to music from Lecrae was almost an impossible task for me. Newer artists have let me down so much that I did not even want to take the time to possibly give Lecrae a chance. Then, September happened. There was a lot of buzz throughout social media about Lecrae’s “Anomaly” album during the ninth month. My attention was immediately grabbed. Buzz? About a Christian rapper? Really? Wow Lord. My research began. I found out that Lecrae does not like to be labeled a Christian rapper. He prefers to be labeled as a Christian who raps. Got it. I found out that teens are heavily into to Lecrae. Love it. I found out that a movement sent by God in the form of Lecrae has been gaining steam for years. On it. I knew enough and immediately downloaded “Anomaly.” And with that, everything I assumed about Christians who rap went out the window. I was not sure what to expect but I would soon find out. The album opens with a song that literally left me with my mouth open. “Outsiders” is an ode to the people in the world who do not fit in. The people who were created to stand apart. The people who refuse to conform to the world. This was me! Ever sense I discovered my purpose, I knew my journey would differ from most. To say I have been on the outside looking in many times would be an understatement. This song confirmed that “I’m not alone cause there’s plenty people like me.” As the tracks continued to play, I was awe struck by the delivery of the messages. 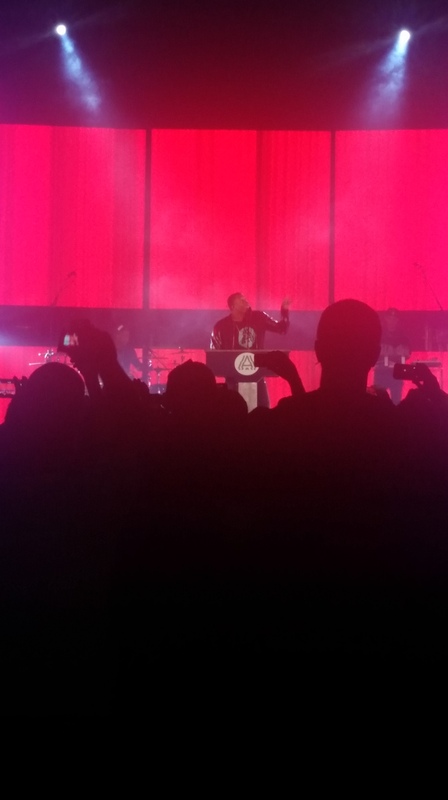 Lecrae was not saying God and Jesus in every other sentence and still the messages resonated loudly. It was in those moments that I realized that Christians who rap can effectively get across the message that God has sent through them without saying his name 50 times in a song. As long as He is the foundation, the words still have power. I have listened to “Anomaly” over and over from two and a half months straight. I have been a witness to Lecrae seizing the number one spot on the Billboard 200. Number one ya’ll. I have celebrated on Twitter with my brothers and sisters in Christ when #LecraeOnFallon became a reality. 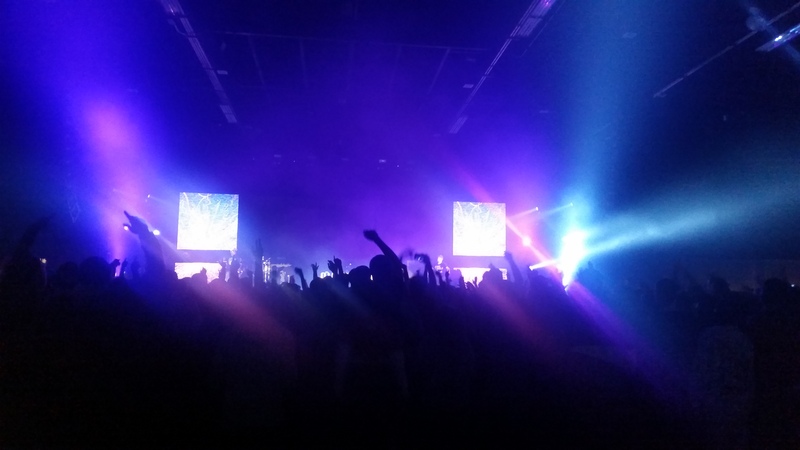 And last night, I worshipped and praised the Lord with thousands of my fellow brethern at The Anomaly Tour. What I witnessed last night was amazing. The Greensboro Coliseum Special Events Center could have easily been called The Melting Pot last night. There were people in attendance from all walks of life. There were representatives from numerous age groups, ethnicities, cultures, backgrounds, countries and races. And everyone was on one accord as we all partied, screamed, sang, rapped and gave God praise. The show opened with DJ Promote setting the atmosphere for the show. It was great to hear a DJ set that was free of profanity and mixed so well that it was easy to forget at times what songs we were listening to. After the completion of his set, I unlike most in attendance, was sort of introduced to Andy Mineo. He is featured on the “Anomaly” album but that was relatively all I knew about him. Just as before, I had not taken the time to really do my research on him. By the time his set was finished I was hanging my head. Andy Mineo is so dope! Just as before, I was awe struck by the delivery of the messages. I was left wondering, how could I have let him stay under my radar for so long? Now, that is a moot point. Now I am on a mission to hear all of his previous work as well because I can see God working in and through him. Andy, if you are reading this, you gained a new fan last night. I cannot wait to see what else God has in store for you! 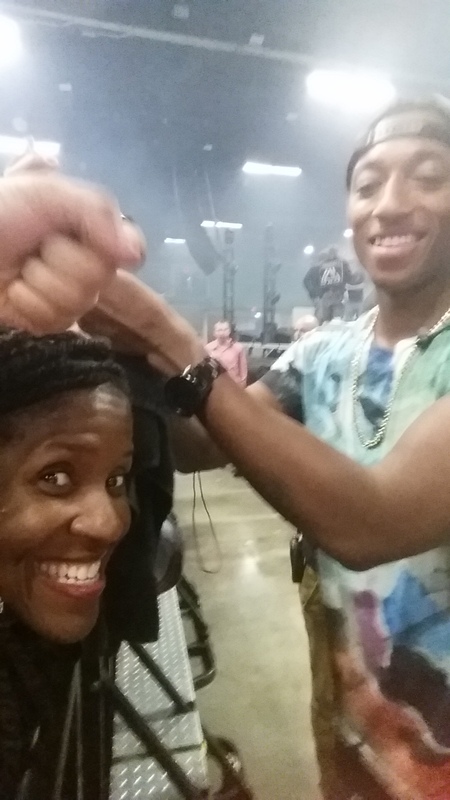 Then it was Lecrae’s turn. The electricity that had radiated through the building during Andy Mineo’s set continued throughout Lecrae’s set and rightfully so. 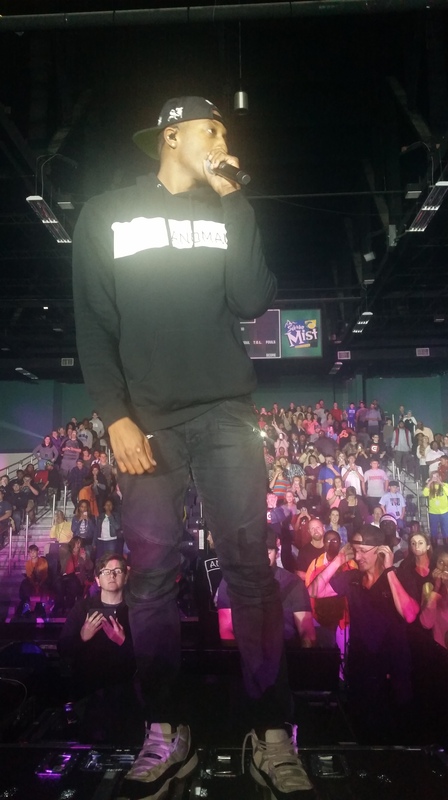 From start to finish, Lecrae set the stage on fire with his personal testimonies, songs of encouragement and humor. I had been giddy all day from the thought of hearing the “Anomaly” album live and disappointed I was not. The best moment of the set was easily when Lecrae snuck into the audience and performed. I was sitting two rows in front of the audio engineers when Lecrae surprisingly appeared on top of equipment behind us. Lecrae. In the crowd. Crowd goes wild. Oh and he spoke to me while he was up there. Take that, take that, take that. The show was everything I hoped it would be and more. To the encore of “Say I Won’t” to the teens jumping up and down to salsa dancing, it was a party. One that pleased God. Much like sports, music can unite us across cultures. Music can remove whatever boundaries we have when it comes to how to we interact with our fellow brethren. Much like sports, music can draw us together to root for one common goal. Last night the goal was simple: to glorify God. The music last night allowed us to wallow in the love that God desires us to have for each other. To be able to co-exist and appreciate the differences He created in all of us. He created us to stand out. He created us to give Him glory and spread love. He created us to be…anomalies.